Tightly rolling a mummy bag makes it easier to carry when hiking. 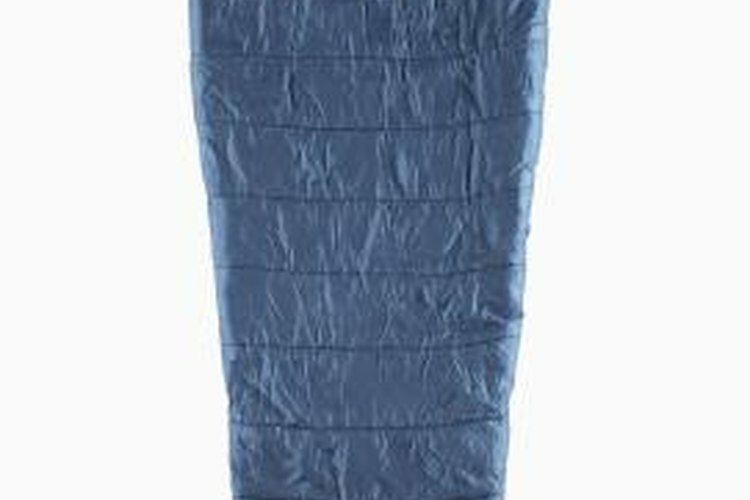 The mummy sleeping bag derives its name from its appearance. Bulging near the top and tapering at both ends -- like a sarcophagus -- the shape of the bag is intended to offer maximum warmth and comfort. Though narrow, mummy bags can be difficult to compress due to their bulky insulation. Keeping the bag aligned and using a tight roll can help to minimize the volume of a mummy bag when rolling it up for travel. Unzip the mummy sleeping bag and remove any items that may be stored in the bag, such as clothing. Zip up the bag once the inspection is complete. Lay the mummy bag out on a flat surface. Fold the bag neatly in half lengthwise; make sure the top, bottom and side ends line up so that the bag is in proper alignment. Start rolling from the bottom of the sleeping bag toward the top. Use a small and tight roll to release the air within the folds of the bag, which will help to compress the bag. Stop periodically to check that the bag remains straight; the alignment may become disrupted while rolling due to the mummy bag's odd shape. Hold the mummy sleeping bag in place with a knee following the last roll. Secure any straps around the bag to keep it tightly rolled. Place the sleeping bag in a nylon or mesh storage bag. Roll mummy bags only when traveling to or from a camping site. Constant compression can ruin the puffiness of the insulation. Allow the bag to hang in a closet when at home, or roll it up loosely and store it in a cotton pillowcase.